A few years ago, we once did a quick back-of-the-envelope calculation and concluded that a relatively small patch of land in Africa could supply all biofuels needed to power all air traffic in the world's busiest skies, those of the US. 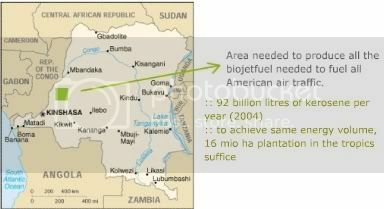 Some laughed at the idea, but meanwhile, the use of biofuels for aviation is becoming a reality. Much quicker than anticipated. What's more, the man pushing the revolution is looking to Africa for sustainably produced supplies. Rudimentary map used during heated 'Peak Oil' debate in 2004. The first commercial aircraft, a Virgin Atlantic 747 jumbo jet, powered by a 60% biofuel-kerosene blend will fly next year in what could be a historic step towards airlines reducing their oil consumption and carbon dioxide emissions. The project was announced by Sir Richard Branson, and includes Boeing and General Electric, the engine-maker, as partners. They hope to have the “green” jumbo airborne in 2008. The airline and its partners are testing up to eight biofuels to determine which is most effective at altitude. Ethanol, which is becoming an increasingly popular alternative to petrol in cars, has been rejected because it does not burn well in thin-oxygen environments. Biobutanol and synthetic biofuels offer better performance. There are several initiatives underway aimed at studying biofuels for aviation. So far we have seen breakthroughs in Brazil, where a biofuel company is cooperating with Boeing and NASA (earlier post) as well as in Argentina, where the airforce has been testing biofuels mixed with jet-fuel ('bio-kerosene') (earlier post), whereas the U.S. Air Force has been experimenting with synthetic fuels, which can be made from biomass (earlier post). The University of North Dakota recently received a US$5 million grant to develop military bio-jet fuels (earlier post). More recently private company Diversified Energy developed biofuels that withstand very cold temperatures and could be used in aviation (earlier post), whereas North Carolina State University found an innovative technology for the production of biofuels for jet aircraft (earlier post), whereas a study for the US Military, written by Sasol, concluded that synthetic biofuels (Fischer-Tropsch) can power the entire military - including its airforce - in case of severe oil supply disruptions (earlier post). Converting an aircraft to run on biofuel was thought to be a much longer-term project and the announcement from Virgin today will surprise those in the industry who have scorned the idea. Aviation is one of the fastest growing sources of greenhouse gas emissions and is likely to be brought into the European Union's carbon emissions trading scheme from 2012 (earlier post). Virgin hopes that biofuel-powered aircraft could be operating commercially within five years, which could help to cut significantly the airline industry’s carbon dioxide emissions. The trial will experiment with a mix of 60 per cent bio-fuel and 40 per cent kerosene, potentially enabling Virgin Atlantic to halve its carbon emissions. Sir Richard said Virgin Fuels, the group's new green energy division, was looking at the possibility of developing butanol as an aviation fuel in preference to ethanol which freezes at the altitude flown by jet aircraft. Bio-fuels can be produced from a wide variety of crops including sugar beet and wheat. But Sir Richard said it was possible the crops could be grown in Africa, thereby helping to alleviate poverty on the continent at the same time as safeguarding the environment. Kudos to Branson. What today is looked as either kooky or visionary, depending on your vantage point, may lead the way tomorrow towards a more sane world.